Abies firma, commonly called momi fir or Japanese fir, is a large, aromatic, conical-pyramidal, needled evergreen conifer that typically grows to 100-150’ tall in its native habitat. 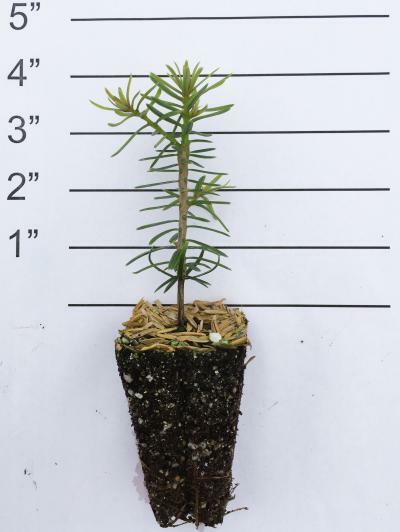 It is likely to mature to a much smaller height (to 40-60’ tall) in cultivation in the U.S. Branches on younger trees are ascending, but become more horizontal with age. This fir is native to hills and mountain slopes in central to southern Japan from near sea level to about 6,000’ where it grows in a variety of locations on both dry and moist sites. It is the most widely distributed fir in Japan where it is considered to be an important timber tree (flooring, crates, and paper pulp). Needles (to 1 1.5” long) are strongly two ranked, appearing like a 2-sided comb, forming a wide V shape on the lower twigs. Needles on young trees are tipped by two sharp prickles at the apex. Scaly, rough, fissured bark is gray, but becomes corky as it darkens with age. Flowers appear in April-May. Conical seed cones (to 3.5 to 5” long) emerge green in spring, but mature to yellowish-brown and are erect and showy throughout summer. As is distinctive with the firs, the upright seed cones disintegrate (scales drop) in fall after the seeds ripen, often leaving only the erect central spike of the cone axis. Much smaller cylindrical pollen cones (to 1 1/4″ long) droop from the leaf axils. Best grown in rich, consistently moist, slightly acidic, well-drained soils in full sun to part shade. Best in full sun, but appreciates some part afternoon shade in hot summer climates. Likes moist cool locations, but, unlike most other species of fir, does respectably well in the hot and humid weather conditions of the deep South. Tolerates heavy clay soils. New growth in April is susceptible to damage from late spring frosts. 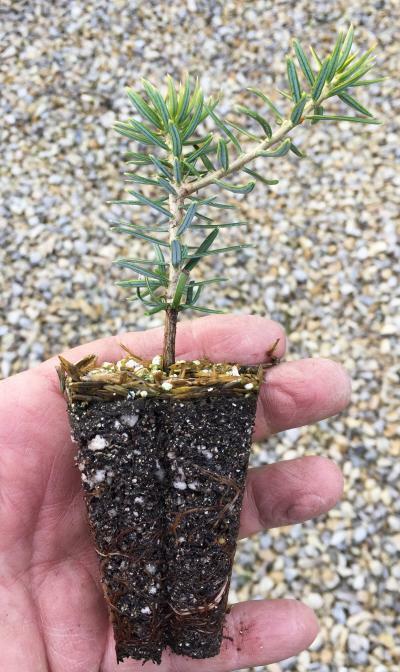 Large specimen fir for the landscape. Screen. Christmas tree. 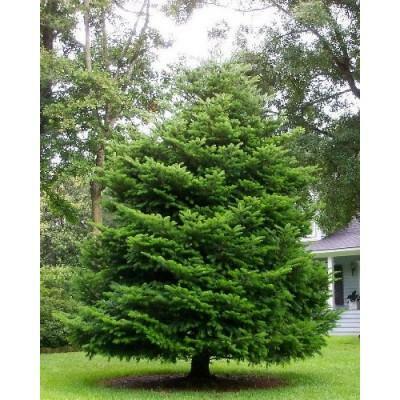 Best fir for growing in the hot and humid conditions of the southeastern U.S.